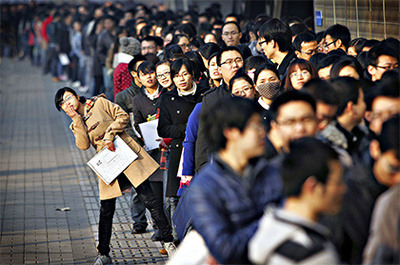 10 problems that lead to South Korean unemployment, and 10 ways to fix it. A few years ago I got a job with a Korean company. 5 weeks into the job, we did not have a single conversation. Not one word was uttered other than “good morning.” There were a lot of business opportunities, business growth opportunities, potential clients that I knew. For business to grow, conversation has to take place. Hiring people to dig holes in the morning, and fill the holes up in the evening. Without job descriptions, no one knows what it is that they are supposed to be doing. So that's a lot of money lost on wages for ventures that were not productive. Titles as get out of jail free cards. You can bully, harass, intimidate, be vulgar, throw things and get away with it. Naturally talented workers seek jobs at better places. The government thinks human resources are the same thing as home and garden decoration. Take the guy from SNU and put him on the left. Take the pretty girl from KU and put her on the right. Take the guy whose uncle is the Minister of Funny Walks and put him at the center. Then let them dig holes in the morning and fill the holes in the evening. The financial market thinks human resources are the same thing as home and garden decoration. Take the Harvard Business school guy and put him on the right. The Yale school of Business guy and put him on the left. The Stanford Business School guy and put him on the center. Then let them dig holes in the morning and fill them up in the afternoon. Businesses think human resources are the same thing as home and garden decoration. Take the guys with an MBA from KAIST and put him at the left. The guy with an MBA from SNU and put him on the right. The guy with an MBA from Yonsei and put him at the center. Let them dig holes in the morning and fill them up in the afternoon. The general cares more about his portrait than about the battlefield. People don't really know what their work options are. Hint: you want to do a general survey about what jobs are available in the country. Fishing, plumbing, selling furniture and becoming a priest or a pastor or a butcher should be alternative job paths. Korean clients tend to be rude and difficult to satisfy. That creates a vicious cycle of rude clients and of store owners who think they are automatically dealing with rude clients. Korean salesmen tend to be rude, tend to lack information on the product, and tend to be deliberately sloppy in their sales approach because they don't want to do the paperwork that goes with the sales transaction. In some cases they only show you the low-quality products with hopes that you don't buy them. Other times they just tell you that your desired product is not available. Bonus: number 11. Ever since the smoking ban in pubs, a lot of factories buy drinks at the grocery store and drink on the factory floor where they can smoke. They order chicken or Chinese food rather than go to restaurants and pubs and overindulge in food and drinks. That means a lot of pubs and restaurants gone bust. Now to the solutions to these problems. 1. Korean businesses, the financial market, and the government need to understand that working is not digging holes in the morning and filling them back in the afternoon. 2. Adopt a system of “task-based career for life” rather than “rank-oriented career.” A “task-based career for life” is a career where you do the same task or group of tasks over and over for your entire career. You might or might not get promoted, you might or might not change tasks, but as long as the company will be around, you will be doing that task. Salesmen will sell. Accountants will do the accounting. Payroll accountants will take care of payrolls their entire careers. Inventory accountants will take care of inventory their entire careers. 3. The problem with “rank-oriented” careers is that no one is indispensible in rank-oriented careers. People lose their jobs easily, and have to find a new one. Not good for unemployment. 4. The smoking ban has hurt the coffee shop, pub and restaurant business. Those three businesses account for significant proportions of the GDP. 5. Generals need to know the battlefield. 6. Soy bean paste men and women. It's slang for men and women who have complexes regarding their economic and financial status and who want to give the impression to other people that they are the sons and daughters of the CEO of Samsung or something. They wear expensive clothes and fancy handbags, drive expensive cars, then they go to cheap stores or restaurants and treat the local staff like they are their servants, just to give the impression that they are some kind of celebrity. These people used to exist just in Gangnam, Seoul, now they exist all over the place. A media campaign needs to deal with this issue, as in many indirect ways, it hurts the economy. 7. La folie des gradeurs. A used-car park owner owns 20,000 cars. A small restaurant with five tables has 70 items on its menu. A real-estate developer develops a compound with 10,000 housing units in a city of 60,000 people. A small, deserted street has 7 coffee shops, 3 hairdressers, 20 restaurants, a health club, 10 karaoke, and 9 pubs, two bakeries and two taekwondo schools. Just because there's a festival once a year during which a lot of people visit, stay a couple of days and leave. 8. Real estate scams. Real estate promoters promise businessmen that the street is very crowded. Businessmen should spend a couple of weeks observing the street before renting or buying the business property. 9. In business, the more you know, the better. Rather than generals gossiping about their officers and sergeants, you need generals who get reports from officers and sergeants. 10. No incentive to keep the sales up. Koreans tend to pretend that products are not available to avoid having to look for them, sell them, in some cases do the paperwork to sell them. Or in some cases only focus on big transactions and let go of small transactions. Or in some cases refuse to sell to people just because they don't like the way the person is dressed up. That means a lot of business fail not because there were no clients, but because staff turned away the clients.